"I think that there will be different types of advertising on the search results page. As you know, my theory is always that the ads should match the search results. So if you have text results, you have text ads, and if you have image results, you have image ads. So as the page becomes richer, the ads also need to become richer, just so that they look alive and match the page. (...) So while I do think the ads will look different, they will look different in format, or they may look different in placement, I think our commitment to calling out very strongly where we have a monetary incentive and we may be biased will remain." At the Citigroup Technology Conference in New York, Nicholas Fox from Google gave an example of video ad for a local butcher that would work better than a standard text ad: "a video with shots of fresh meat and the overall store experience". He also assured us that Google will be careful about user experience and the new ads will be placed only if they're really relevant. 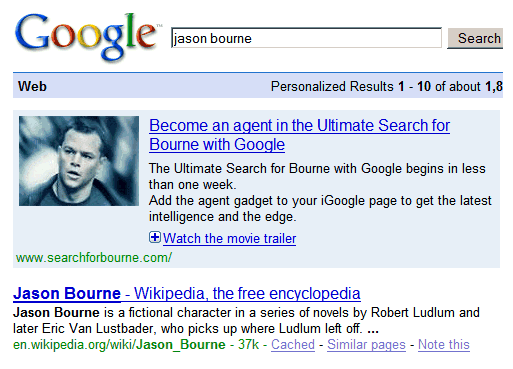 The promo for "The Ultimate Search for Bourne" was probably the most complex ad ever included in a Google search results page: it included a small image and an option to view the trailer inside the same box (the video was hosted at YouTube). Google now also includes big blue buttons next to the ads from advertisers that accept Google Checkout as a method of payment. Another interesting experiment shows the address of the business, a static map and an option to get directions next to local ads. The main advantages of the text ads are that the page loads faster, they're not obtrusive and blend with the rest of the content which mainly consists of text. Now that search results also include geographical information, images, videos, news and the content is more diverse, the ads could also be richer. Google will probably keep the current text ads and use Plus Boxes to expand the content. Personalization is another thing that could put the ads in line with search results. "My philosophy is that the ads and the search results should match. [And when it comes to targeting,] search and ads are almost the same," said Marissa Mayer. "I'm the product manager responsible for the way ads look on Google. You will not be distracted by image ads or video ads on Google search results pages. Period. Just because other companies use image ads and video ads with the _purpose_ of distracting users doesn't mean Google will do that. Images and videos can be useful and entertaining, if you see them when you want to see them. It's taken us a long time to figure out how to do it right. BTW, how many _years_ do we have to be in business before people learn Google isn't motivated by short-term greed? Yes, we want to make money. We want to make money 10 years from now. The only way to do that is to build great products that people want. I think we've done a pretty good job of that so far, and we're not planning to stop." Alf (above)is a Spammer. I think Google could address some of the spam comments in Blogger by somehow incorporating their Gmail spam filters...or not! Is Google going this route to avoid the revenue loss from the Firefox Ad Blocker? Anonymous, how do you imagine that? This will only avoid revenue loss for Google itself, because these ads'll be shown in search results only, but not in Adsense blocks on other sites. Thanks, Derek. I deleted that comment and I've already complained about Blogger and spam comments. Now I see a lot of spam comments on YouTube. I really really hate ads (esp. the blinking variant, but also everything w/ sound), I hate how sites waste loding time and banwith for the useless crap (to me, ads are nothing else than someone wanting to manipulate me, no thanks). But I never bothered to do anything against Google's text ads. It's easy to just not look at them. With "richer" (read: more annoying) ads coming, I will do everything I can to get rid of them. But everyone could see this coming. What we had was just too good to be true. Hey - ads on the web enables you to get free content!! did you ever think about it?